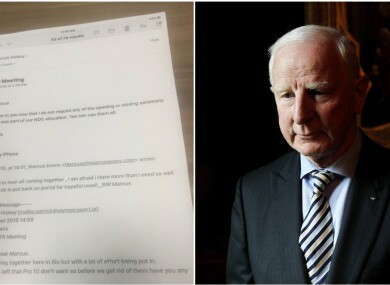 Clarification: On 23 August, 2016, TheJournal.ie published an article entitled ‘Rio police publish emails between Pat Hickey and THG discussing sale of Ireland’s Olympics tickets’. Contained within were quotes from members of the Rio police force which said that they wished to speak to John Delaney in relation to their investigation into the sale of tickets for the 2016 Rio Olympic Games. We accept Mr Delaney’s position that he had no involvement in relation to ticket sales for the Rio Olympic Games. Sinéad O’Carroll reports from Rio de Janeiro. RIO POLICE CLAIM they have seen emails between Marcus Evans of THG and former Olympic Council of Ireland chief Pat Hickey discussing the sale of tickets for the 2016 Rio Olympics. In a press conference this evening Irish time, investigating officers revealed they had seen weekly emails between the pair dating back to 2010. There was also an exchange on 3 August, two days before the start of the Olympics. According to police, the emails discussed the sale of tickets allocated to the OCI. Officers believe a hospitality programme was established to ‘disguise touting’. Tickets destined for the public ended up with THG, they said during today’s press conference. Rio police have also told TheJournal.ie they want to establish FAI CEO John Delaney’s involvement with the OCI’s handling of Rio 2016 tickets. The investigators say their probe has uncovered that the OCI facilitated tickets to reach THG (the hospitality group) by transfer through Pro10, an Irish company based in Lucan, Dublin. THG had been the OCI’s official ticketing agent for the London Olympics in 2012, but had not been authorised by Brazilian authorities to sell tickets for the Rio Games. THG and Pro10 both say they back the Irish Government’s independent inquiry into the affair. Rio police also claim that Patrick Hickey and Marcus Evans constructed Pro10′s response after Kevin Mallon’s arrest. At this evening’s press conference, police said Hickey had initially told them he had only met Evans in 2012 and that he only made contact after Mallon’s arrest to complain that his name was being sullied. Police say weekly emails between the two since 2010 contradict this. Hickey, who is detained at Bangu Prison, did not appear before a Rio court today because prosecutors have not yet been able to present their case before a judge. Speaking to TheJournal.ie, investigating officer Aloysio Falcao said Rio police want to establish if FAI CEO John Delaney was involved in any way with the OCI’s handling of Rio 2016 tickets. Patrick Hickey said in the police station that all the decisions were made by the executive council and these guys are the big guys in the OCI,” he said. “We want to know if he was participating in this case or not. We have to listen to Kilty and Martin on Thursday. And also, we want to send to the Minister of Ireland to check the information about his [Delaney's] [alleged] involvement in this scandal. Mr Delaney denies any role or involvement in any decision making regarding the granting of the OCI ticketing licence for Rio 2016. Former world champion race walker and four-time Olympian Olive Loughnane took to Twitter to express her frustration at the OCI’s handling of Ireland’s Olympic tickets. Three other Irishmen were due to meet with police at a Rio de Janeiro station today to discuss the ongoing probe into the alleged illegal selling of tickets for the Olympic Games 2016. OCI executives Kevin Kilty, Stephen Martin and Dermot Henihan were due at ‘Police City’ in north Rio at 2pm (6pm Irish time) today, but only Henihan turned up, at approximately 6.10pm. Henihan, the OCI’s honorary general secretary, has been told he is now free to leave, and Rio police say judge will return his passport. The other two OCI members, Chef de Mission Kevin Kilty and CEO Stephen Martin, have been asked to give testimonies on Thursday. It is understood both men will have lawyers in the city then. A spokeswoman for the OCI said: “Mr Kilty and Mr Martin will not be going to the police station today. It is looking like it will be tomorrow or more likely Thursday before they go to the police station as I understand it. Leading investigators are currently holding a no-holds-barred media conference detailing some of the evidence so far. The Brazilian legal system is based on the Napoleonic Code, meaning that some legal norms differ to Common Law jurisdictions like Ireland’s. Hickey’s legal team had earlier confirmed that there will be no hearing today. “The judiciary recess ended today and the prosecutor has not yet present his case before the judge. So it will not be possible for the judge to whom the case will be assigned to already be aware of the matter,” they said this morning. Hickey, who has temporarily stepped down from his position as president of the OCI, is currently being held at Brazil’s largest prison having been denied bail. He is currently sharing a cell with fellow Irishman Kevin Mallon in the notorious jail. It’s not believed that Hickey’s case will be heard until next week because of a backlog that’s been created by the games themselves. The backlog of some 800 cases dates back to 5 August when the courts went on holidays with Hickey’s case not lodged until 19 August. The cases will be processed in the order at which they came in meaning Hickey’s will have to wait. A manager of one of the Brazilian judicial processing units has said there will be “no fast-tracking” of Hickey’s case. Kilty, Martin and Henihan all had their passports confiscated by police on Sunday on foot of a magistrate’s warrant. During a raid on their offices over the weekend, their phones, laptops and other items were taken. They also had to reschedule flights back to Ireland. Although their names are on a warrant, no wrongdoing has been suggested on the part of any of the men – or by Willie O’Brien, Linda O’Reilly and John Delaney who also appear on the court document. Pat Hickey’s legal team has denied any wrongdoing on his behalf. In a statement last night, his representatives said that he was arrested “due to suppositions that are not supported by any material evidence or proof of the alleged facts presented by the police”. His arrest has no legal support. The investigation did not bring one single slight indication that Mr Hickey could be involved with the facts therein investigated, and his detention was required by the police authority under mere assumptions. The statement said that Hickey “did not try to escape as informed by the police”. The statement says that the video shot during his arrest “shows that he was awakening at that very same time, wearing a robe. His wife was taken by surprise with almost 10 men standing on her door at 6am, and panicked”. Mr Hickey did not resist to the arrest order, and all the rest is unreal story told to make the headlines. Speaking to the Irish Independent yesterday, Chef de Mission Kilty revealed he had not spoken to Hickey since his arrest. Email “Rio police publish emails between Pat Hickey and THG discussing sale of Ireland's Olympics tickets”. Feedback on “Rio police publish emails between Pat Hickey and THG discussing sale of Ireland's Olympics tickets”.